Invests in pulsion and diesel-elec- tric technology com- bined. Imabari Shipbuilding Co., Ltd. se- cured newbuild orders with the coop- eration of Marubeni Corporation for eleven 20,000TEU Ultra-Large Con- tainer Carriers, when delivered the largest containerships in the world. Thunderbolt the largest in the world, as well as the 8,100TEU type in 2008. 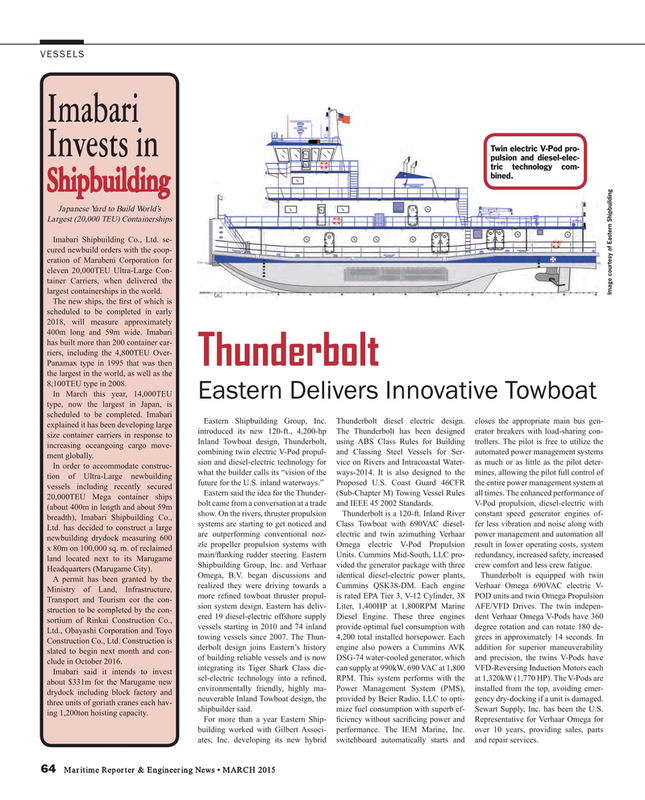 Inland Towboat design, Thunderbolt, using ABS Class Rules for Building trollers. The pilot is free to utilize the increasing oceangoing cargo move- combining twin electric V-Pod propul- and Classing Steel Vessels for Ser- automated power management systems ment globally. Shipbuilding Group, Inc. and Verhaar vided the generator package with three crew comfort and less crew fatigue. Construction Co., Ltd. Construction is derbolt design joins Eastern’s history engine also powers a Cummins AVK addition for superior maneuverability slated to begin next month and con- of building reliable vessels and is now DSG-74 water-cooled generator, which and precision, the twins V-Pods have clude in October 2016. Imabari said it intends to invest sel-electric technology into a re? ned, RPM. This system performs with the at 1,320kW (1,770 HP). The V-Pods are about $331m for the Marugame new environmentally friendly, highly ma- Power Management System (PMS), installed from the top, avoiding emer- drydock including block factory and neuverable Inland Towboat design, the provided by Beier Radio, LLC to opti- gency dry-docking if a unit is damaged. three units of goriath cranes each hav- shipbuilder said. mize fuel consumption with superb ef- Sewart Supply, Inc. has been the U.S. ing 1,200ton hoisting capacity.